Despite having no feed-in tariffs or subsidies to speak of, the Chilean solar market is among the first in the world to prove self-sustaining, with new projects able to be produced at or below grid parity, according to new research by Deutsche Bank. With only three solar plants connected to the grid – constituting a total capacity of 3.5 MW – and around 70 MW under construction, Chile had already achieved grid parity for solar PV in some parts of the country by midway through last year. In June 2012, Spanish-based Solarpack revealed their 1MW grid-connected PV plant in Chile was able to generate and sell energy at market prices without any public subsidies. The project was funded entirely by the developer. In Deutsche Bank’s new report – Chilean Market: At Grid Parity, But Not Without Challenges (a follow up to its global assessment of solar markets, which concluded many were near a major inflection point) – it says that the Chilean market is exciting primarily because solar development in the region does not require any form of government incentive. Deutsche says high power prices coupled with high solar penetration levels in the north of the country are enabling grid parity and fueling a robust pipeline of projects. The investment bank estimates that fully equity-funded Chile solar installations will be able to generate electricity at an LCOE of $0.12-0.18/kWh, making solar cost competitive with traditional forms of generation, which costs between $0.15-0.25/kWh. Despite this potential, the report warns that the solar market in Chile “will favor experienced players with patience,” with its ~3.1GW backlog facing various difficult challenges. “We expect extensive permitting and offtake needs will translate into a reduced funnel of viable projects as pipelines move forward,” says the report. Deutsche says the Chilean electricity market is characterised by high prices, near total private ownership, and extensive industrial sector demand particularly from the mining sector. Currently, around 18.3GW of installed capacity is dominated by natural gas, hydro and coal generation. In this environment, says the report, there could be some difficulty in bringing new capacity to market, with the necessary additional transmission and distribution assets likely to be slow to develop. 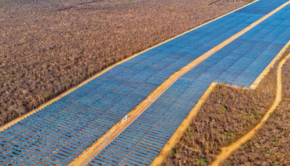 Deutsche says it expects the majority of Chile’s near-term solar installations to be located in the Sistema Interconectado Del Norte Grande (SING) – the biggest of Chile’s four electricity networks, located in the drier north of the country – which may lead to difficulties in implementation and integration into the grid. But, as has been predicted for Australia, it could be Chile’s mining sector that comes to the rescue of the fledgling solar market. As the Deutsche report notes, poor grid reliability and rising electricity costs are driving companies in the world’s largest copper producer to consider self generation or collaboration on solar projects. The report notes that self-generation projects like this not only appear attractive for mining companies in need of reliable low-cost generation, but are also separate from the grid and therefore represent additional upside of reduced permitting requirements. “While the pipeline of solar projects in Chile may face some regulatory and logistic hurdles, we expect strategic partnerships with mining companies to be a good source of growth for solar companies,” the report says. “Mining companies appear to be among first movers helping to bring projects to completion as they seek to shore up their long-term electricity needs and improve their environmental image. Long term PPA’s have been signed in the $100-120/MWh range which is competitive with gas (~$120s/MWh) and coal (~$80s/MWh), with no commodity risk.